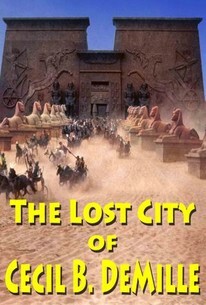 The Lost City of Cecil B. DeMille chronicles documentarian Peter Brosnan’s 30-year effort to establish the existence of a 1923 silent movie set said to be buried in the sands on the coast of California. He skillfully interweaves this tale with an overview of the extraordinary career of that film’s director: Cecil B. DeMille. After a decade of directing smash hits, his religious upbringing inspired him to embark on an ambitious Biblical epic The Ten Commandments. To recreate the city of the Pharaohs, he and designer Paul Iribe,(the founder of Art Deco) built a massive set 100 feet high and 800 feet wide on the beach of the small town of Guadalupe, north of Los Angeles. When the movie wrapped, the set mysteriously vanished. Almost 60 years later, Brosnan and a friend from NYU Film School, Bruce Cardozo, became intrigued by this mystery (alluded to in DeMille’s autobiography) and decided to make a documentary about it. It’s simple. Hire an archaeologist, interview some old timers involved with The Ten Commandments and “…the film seemed to write itself.” Hollywood was enthused. Bank of America was enthused (its founder, A.P. Giannini, had financed DeMille). The press was enthused. Not enthused, however, were the California bureaucracies that issue the permits necessary for the project. After 30 years of starts and stops, Brosnan and Co. were finally able to excavate the set’s location for two weeks. The film is replete with terrific old film clips and archival news footage. Best of all, over the years, they were able to secure great interviews with people involved with DeMille and his 1923 film. Jesse Lasky, Jr., son of one of DeMille’s old partners (himself a screenwriter who worked on the 1956 Charlton Heston remake) is a Hollywood raconteur straight out of Central Casting. 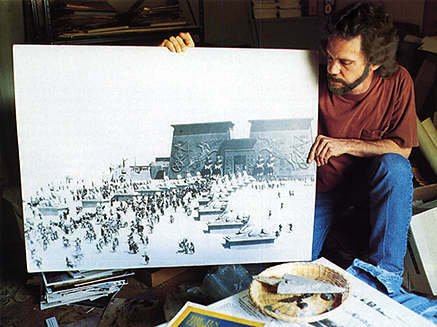 There’s a man who, as a kid, snuck into the studio to watch the parting of the Red Sea (done with jello, and, yes, he did taste it before being chased off). Townspeople from Guadalupe give a sense of the Wild West exuberance of silent filmmaking. Most touching, actress Leatrice Joy, recorded on audio days before her death, tells of DeMille’s reverence for the Jewish people. It’s a feast for old film buffs, but for better or worse we seem to be a fading lot. A recent study showed Millennials are not very interested in old movies. The World War II generation, still active in 1982, who grew up during DeMille’s heyday, is almost completely gone. Their children, who like this reviewer, saw the 1956 film in the theatre, are like Brosnan (seen over 30 years) greying. Some, like Cardozo have already passed away and the film that he helped conceive is dedicated to his memory. The Gianninis no longer own Bank of America and Paramount execs deride events that happened “…like what…75 years ago?” Brosnan’s own story seems to be one of dogged completion rather than glorious fulfillment. If that doesn’t give you a sense of “the sands of time,” one of the newscasters reporting on the story of the lost city when it first broke is a boyish, energetic Tom Brokaw.